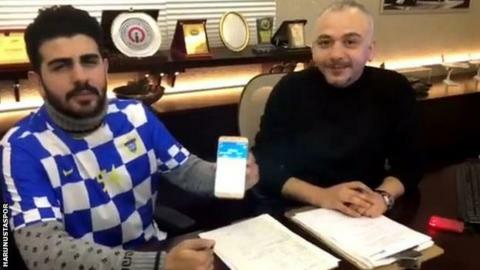 A Turkish amateur side claim they are the first football club to have paid for a player with cryptocurrency. Omer Faruk Kıroglu was rewarded 0.0524 in Bitcoin (£384.12 at 18:00 GMT) and 2,500 Turkish lira (£467.30) to join Harunustaspor, who compete in the Sakarya First Division Group B. "We did it to make a name for ourselves in the country and the world," club chairman Haldun Sehit told CNN Turk. "As my chairman said, we are doing something new," added the player. Cryptocurrency is growing in popularity within sport. Arsenal recently signed a sponsorship deal with a cryptocurrency company, while Barcelona forward Lionel Messi and boxer Floyd Mayweather have promoted the financial technology.